This soft point hunting ammunition from Sellier & Bellot is designed to produce deadly expansion without fragmentation and meat loss. Ideal for any .30-06 Springfield rifle, these cartridges fire a 180 grain projectile at a muzzle velocity of about 2,707 feet per second and will take down deer and other midsized game with ease. 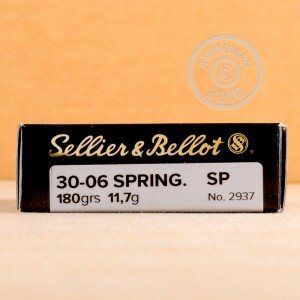 Sellier & Bellot ammunition is manufactured in the Czech Republic using non-corrosive Boxer primers and brass cases. These cartridges come in boxes of 20. 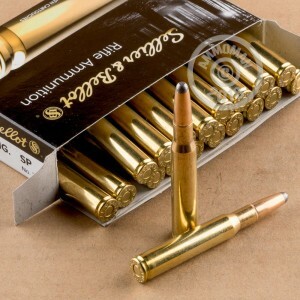 AmmoMan.com has everything you need in the ammo department to succeed on the range and in the field. Place an order today for $99 or more and get free shipping!